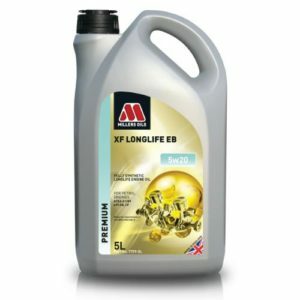 A fully synthetic high performance mid SAPS, low friction, fuel efficient engine oil. 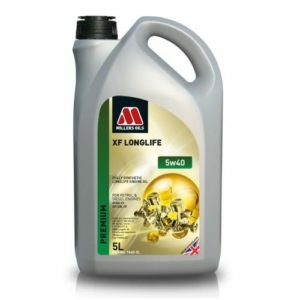 Part of the Millers Oils NANODRIVE Low Friction Technology range. Formulated to meet the demanding requirements of today’s engines with the added benefits of reduced friction, improved fuel economy and a reduction in overall running costs. Suitable for use in petrol and diesel engines meeting Euro IV & V emission standards, with or without diesel particulate filters including VW “Pumpe Düse” engines fitted to many Volkswagen/Audi Group, and some Ford vehicles. 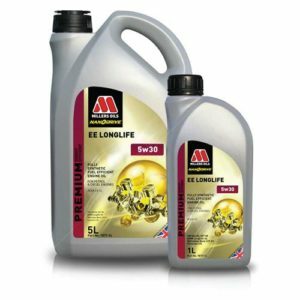 Particularly recommended for use in vehicles using variable service intervals and other vehicles that require a fuel-efficient lubricant. • A reduction in friction of up to 32% providing a reduction in wear of up 32% compared to other 5w40 C3 grades. • The coefficient of friction reduces rapidly as the engine temperature rises maximizing fuel economy and reducing emissions accordingly. • Protects against wear extending engine component life. • A mid SAPS formulation which is compatible with catalysts and diesel particulate filters (DPFs) A single 5w40 engine oil covering many OEM performance profiles.